Check out this potential European high-speed rail network that connects all the major European cities and offer Europeans a fast, comfortable and eco-friendly mode of transportation. It's just too bad that with the current politics this is just a fantasy. But it's a fantasy that could become a reality if we just set our minds to it (just like the >DESERTEC project). How would you design this high-speed rail network? Which cities would you connect? On the old traces of TEN-T project a new high speed rail system could be built basing on the "European corridors". Some high spped rails already exists but are unfinished and non-linear. The main corridors should be five: three verticals, two horizontal. 1. Blue. Lisbon-Edimburgh. Lisbon-Madrid-Bordeaux-Paris-through Eurochannel-London-Birminghan-Manchester-Edimburgh-Glasgow. Also another line wich connects Dublin to Belfast. Let's not forget Ireland. 2. Red. Rome-Stockholm with extentions from Naples to Oslo. Naples-Rome-Florence-Bologna-Milan. - The first branch is Bern-Munich-Lipsia-Berlin-Hamburg-Copenhagen-Stockholm-Oslo. - The second is Strasborug-Luxembourg-Bruxelles-Amsterdam. 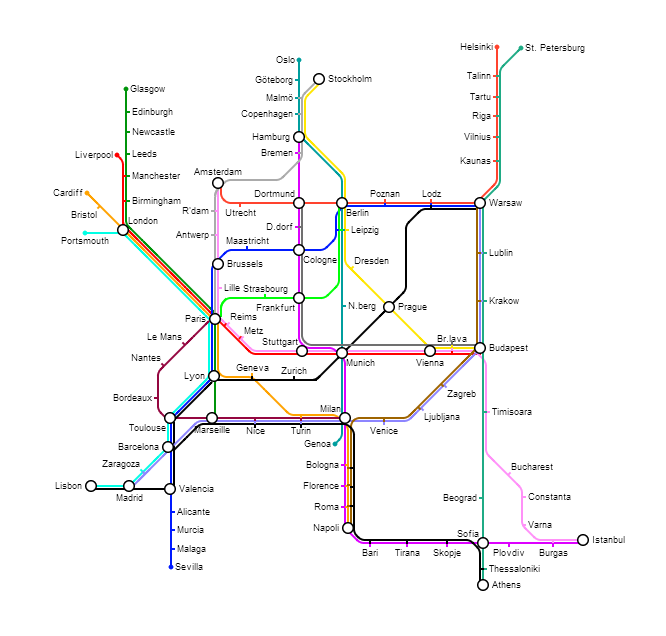 There are some extensions to Prague, Frankfurt, Liechtestein and Lyon. - The first branch is Sofia-Bucarest-Chisinau-Lviv-Minsk-Vilnius-Riga-Tallinn-Helsinki with extensions to Istanbul. 1. Green. Lisbon-Kiev (also known as Corridor 5). Lisbon-Madrid-Valencia-Barcelona-Marseille-Lyon-Turin-Milan-Venice-Trieste-Ljubijana-Budapest-Lviv-Kiev with extensions to Bratislava and Genoa. 2. Light-blue. Paris-Moscow. Paris-Bruxelles-Amsterdam-Berlin-Poznan-Warsaw-Minsk-Moscow with extensions to Prague. Check out the 8 million city project that aims to connect three major Scandinavian cities - Oslo, Gothenburg and Copenhagen - with high-speed railway. "The Scandinavian countries are too small in a global context to use their energy to compete internally. Better/greener communications are crucial in order to shrink the distance between the Scandinavian cities, and unfold the potentials regarding cross border collaboration and a fully integrated Scandinavian labor marked. High Speed Rail (HSR) is not just another transport project; It provides a means of supporting long- term economic development in Scandinavia and doing so in a sustainable way. For the Copenhagen-Oslo corridor the service is estimated to attract 9,4million passenger per year." I believe that the way to peace is further integration between nations and people. And a Pan-European high-speed rail network could help do just that! Wonderful project! The idea is very illuminating, to condensate and unite the energies to be competitive in a global scenario. I'm sure they'll complete it in a few years. But that's the North of Europe, another reality, much more efficient than the South. Think to the bridge of Øresund is a massive project. Here in Italy we have many unfinished projects, especially we have a 500 km highway started fifty years ago and it's not finished yet. Returning to high-speed rails we have Turin-Lyon, started a few years ago but on the French side there are no problems, on ours there's the police 24 hours a day and Beppe Grillo and his entire movement against the project. Lucky us!